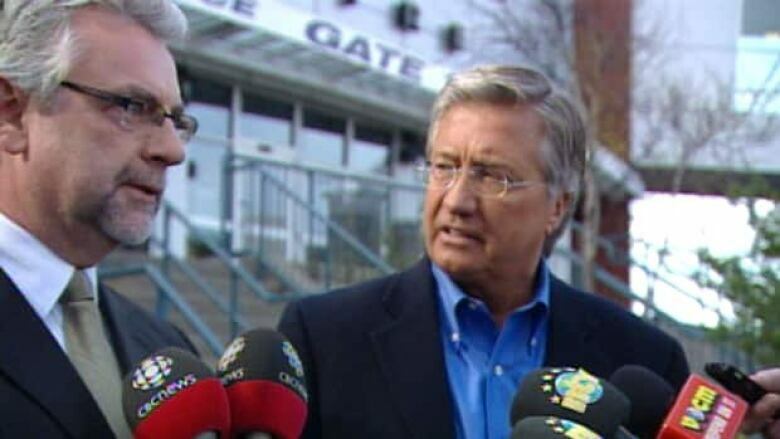 A plan to bring professional hockey back to St. John's will depend on higher ticket prices and a greater stake from corporate sponsors, former premier Danny Williams says. Williams, who is behind a proposal that would see the American Hockey League's Manitoba Moose relocate to St. John's, said the plan can fly, so long as customers agree to steeper prices, the corporate sector steps up and approval is won from outside parties. "We just went at it with a vengeance," said Williams, whose original plan was contingent on a $500,000 subsidy from the Newfoundland and Labrador government. After the government — which Williams led until just last December — took a pass, Williams headed back to bargaining table and late Wednesday afternoon joined Coun. Danny Breen, who sits on the St. John's Sports and Entertainment board, to announce a provisional deal. "It's going to have to come from the revenue side of the equation," Williams said Wednesday evening during an interview on the steps of Mile One Stadium. "We had good discussions over the last couple of days and worked out an agreement, and I'm just delighted to say we pulled it off." Williams said he hope that the prices for season passes and individual tickets can be established in the next week. On Thursday, St. John's city council gave the deal its blessing. Now formal ratification is required from the AHL. The farm team will still be owned by True North, the company that is relocating the Atlanta Thrashers to Winnipeg. True North had already owned the Manitoba Moose franchise, which until earlier this week was the farm team for the Vancouver Canucks. If not the Moose, what name should the new team have?